Undergraduate student Joseph Fretwell recently completed a six-week summer internship in the Digitization Unit at the John F. Kennedy Presidential Library, prior to entering his senior year at Furman University in Greenville, South Carolina. While at the library, Joe scanned photos from the White House Photographs collection. 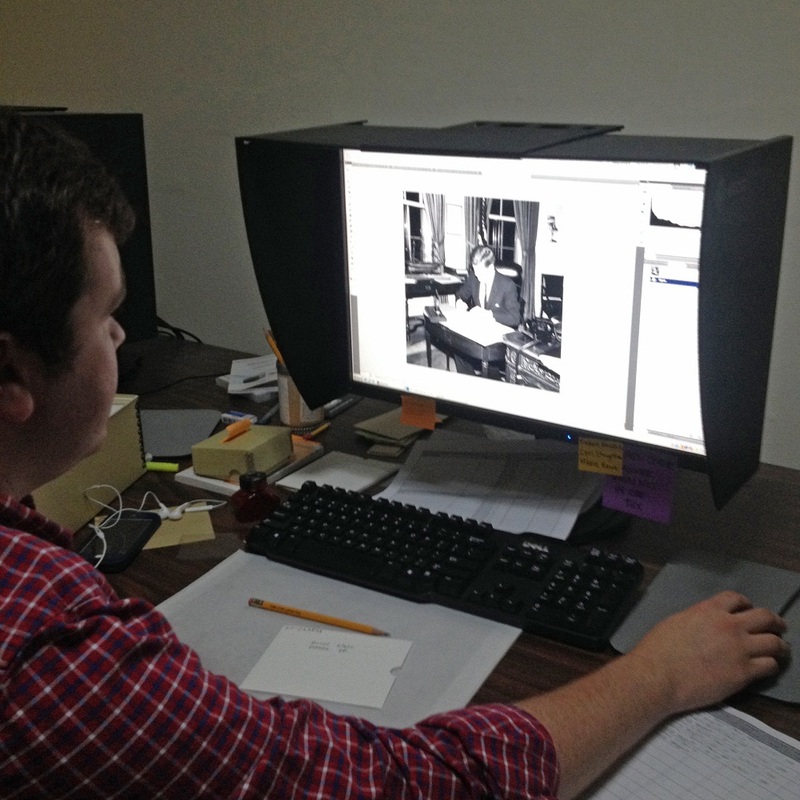 He also learned the principles of cataloging archival photographs. My third week at the John F. Kennedy Presidential Library allowed for more of my own research and work in the library’s archives. I have been working specifically in the research room with the papers of White House staffers like Lee C. White and Burke Marshall. It has been interesting to see how much influence average citizens had on the policy agenda and general discussion within the White House. Big name civil rights activists like Martin Luther King, Jr., Ralph Abernathy, A. Phillip Randolph, and James Baldwin are commonly mentioned in memos between White House staffers. These men also wrote letters to various members of the Kennedy Administration. They weren’t the only ones that the White House got letters from, though. From what I have noticed in my research, some of the most influential letters came from virtually unknown American citizens, from 9-year-old school boys, to aged grandmothers. Before doing this research, I never realized how seriously the White House handled mail from constituents. Perhaps this has changed now, but with regard to the Civil Rights Movement, many discussions between the most influential policymakers in the country were centered on the writings and actions of every day citizens. Seeing the influence of constituent mail in policy talks of the 1960s has, in many ways, helped me to better understand the legacy of President Kennedy. Politics aside, he was a man who believed in the power of the common man to make a difference in public life. In fact, he often called on Americans in his speeches to seek a better world for themselves and their fellow citizens by devoting time and energy to public service initiatives. It’s been exciting to work with photographs and documents of some of the most powerful and renowned people of the 1960s, but I’ve enjoyed even more the fact that I can see and read about the unknown, sometimes nameless citizens who stepped up and contributed to the collective effort toward the passing of the civil rights legislation of 1964 and 1965. In my fourth week at the Kennedy Library, I got started on the second half of my major project. I began to catalog some of the photographs that I have been digitizing over the past couple weeks. Most of my time was spent researching the people in the photos and writing short bios about those who the National Archives and Records Administration did not have complete records of in its system. In this process, I became more familiar with the detail-oriented process of archival research, and I got the chance to learn more about and connect with the figures of the Kennedy era that were not always the most visible, from Secret Service agents to local civil rights activists. My personal research for the week was primarily within Adam Walinsky’s papers. Walinsky was a senatorial staffer and speechwriter for Robert F. Kennedy. In his files, I’ve found various memos and reports on criminal justice reform and plans for community development partnerships. Many of the major themes of the time have obvious parallels with current discussions on race, poverty, and urban decay. I also was able to attend an event at the library one evening last week that was focused on the legacy of James Baldwin, a writer and civil rights advocate of the mid-20th century. The event featured a screening of The Price of the Ticket, a documentary about the life of Baldwin. Afterward, there was a panel discussion on how Baldwin’s words resonate today. Panelists pulled sections from his writings and interviews to explain major current events in Ferguson and Baltimore, as well as public policy issues like community-based policing. 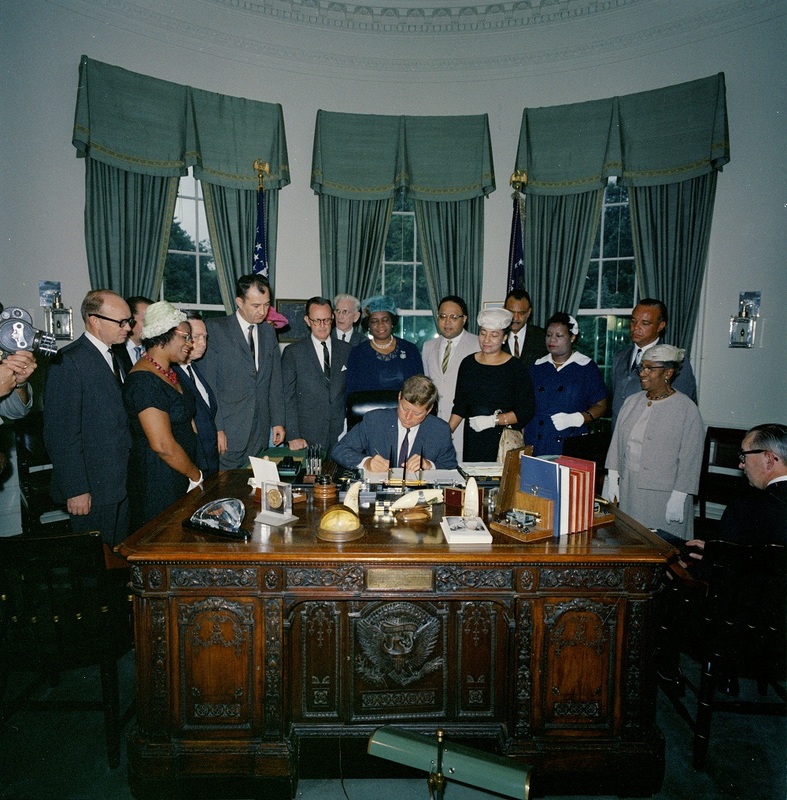 This week at the Kennedy Library, I finished cataloging a series of photographs taken on September 5, 1963 at President Kennedy’s signing of a bill that made the Frederick Douglass historical home an official part of the National Park Service. This process required a good deal of research, as I had to identify and write brief biographical notes for all of the people in the photos. Many of those who attended this event were U.S. Senators and Representatives who wrote the legislation, but there were also several local civil rights activists from groups like the National Association of Colored Women’s Clubs and the Frederick Douglass Memorial & Historical Association. Most of the research I did was new to the National Archives and Records Administration, meaning I am the first person to have cataloged the information for the more local and less-known individuals in the photographs. This made the research more difficult, and I had to dig in old magazines and newspapers to identify some of the people. It was gratifying to know, though, that I contributed to the national database for identifying historical figures. JFKWHP-KN-C23586. President John F. Kennedy Designates Frederick Douglass Home Part of National Park System. I’ve now finished my 6 weeks at the Kennedy Library, and I’ll start my congressional internship in Washington tomorrow on Capitol Hill. My experience at the library in Boston allowed me to work with some phenomenal historical documents and photographs, as well as meet a number of people who do important, behind-the-scenes work. One of my biggest takeaways from the internship was how much work and time goes into archival research and record preservation. All of the people I met and worked with, especially my supervisors in the digitization wing, are crucial to the success of the library. The amount of effort they put into preparing materials for researchers and visitors to the library is incredible. Seeing this made me realize just how important their work, and the work I got to help out with over the past 6 weeks, is to an array of people—researchers, students, public servants, and so on. The documents of the Kennedy Administration, even though just a tiny piece of the many preserved documents of American history, taught me more about current events today than anything I have ever done. Being able to look back at the past through the lens of the White House photographers and through the words of Kennedy’s staff gave me a clear, unbiased glimpse into a time that was really not much different from today. I saw parallels everywhere, from conversations on civil rights to issues of federal oversight to debates over foreign involvement in global crises. This was all important to me, as a person who is interested in policy work in government, because I got to see what worked and what did not. Hopefully, during my next month and a half in Washington, I will be able to bring what I learned in Boston to the table and apply it to issues and conversations over today’s policy issues. Our history matters. It matters to our well-being as Americans, to the direction of our conversations on national issues, and to the routes we ultimately decide to take towards progress. My experience in Boston is one that I will look back on as a great help to my growth as a thinking and contributing member to society.